We survived another year, and there’s nothing wrong with that. Welcome to 2018! Have you resolved to do anything different or special this year? Did you set any training or diet goals? Maybe work or relationship goals? I wish you luck in all cases! So what’s new, and what’s happening in the near future? Take a look. The 2018 Arnold starts March 1st and runs through March 4th in Columbus, OH. Events will include weightlifting, strongman, arm wrestling, powerlifting, Highland games, & of course, bodybuilding. There is definitely no shortage of bodybuilding categories and events. The 2018 USAW Nationals are being held in Overland Park, Kansas May on 24th-27th. The qualifying period ends April 22, 2018, and the registration deadline is April 26, 2018. Qualifying for the CrossFit Games starts with the CrossFit Open, which runs February 22nd through March 26th. There are many stages of the qualifiers, including Regionals. See the CrossFit Season Schedule for all dates. The actual CrossFit Games runs from August 1st to August 5th in Madison, Wisconsin. Step aside Assault and Airdyne bikes, Rogue is in the game now. I do not see much in the way of feedback on the new Echo Bike yet, but it looks to be quite the beast from reading the product description. At $750 and 150-lbs, I can only assume that the Echo is indeed a very heavy-duty and sturdy bike. Regarding some of the Echo’s features, it is portable (wheels), quiet (belt-driven), smooth and stable, and it features a battery-powered LCD console for tracking intervals, distance, calories, heart rate, and more. The seat is adjustable for height and front/back settings, the bike has rubber feet and a black power coat finish. Have you tried the Echo Bike? How does it compare to the Assault Bike or the Schwinns? Leave a comment below. Say goodbye to the big space-stealing deadlift jacks that work, and the space-saving mini deadlift jack that doesn’t work well beyond a few hundred pounds, and say hello to the new Genesis Jack. The Genesis Jack is a lightweight but strong, aluminum deadlift jack that is small enough to throw into a gym bag (not that us garage gymers go anywhere), but designed well enough to create ample leverage to prop up any amount of weight on the barbell. It’s simple to use, requires no assembly to speak of, and can be stored out-of-sight when not needed. The Genesis Jack sells for $90; which I’d say is kind of pricey save for the fact that I think they are being hand-made. Gotta respect that it’s not an import, right? The new 3″x3″ Vulcan Flat Foot is an economy rack offered as an affordable alternative to the RML Flat Foot models, and as a comparably priced but much higher-quality upgrade to the Titan X-3. While still more expensive than the Titan X-3 ($650 versus $515), the Vulcan isn’t made with scrap iron and it includes in the price a multi-grip pull-up bar; which does a lot to balance out that price difference. The Vulcan is made with the same 11-gauge, 3″x3″ high-quality steel as the RML line. It has 10 mm thick gussets at the base and uses quality 5/8″ hardware. Unlike the Titan, the steel is not B-scrap pig iron, the hardware isn’t the cheapest possible brass stuff, and the welds are professional. This Vulcan rack is the perfect compromise between expensive and junk. Absolutely worth mentioning is that you can add this rack to a bar+bumper set at a heavily discounted price; $100 actually. 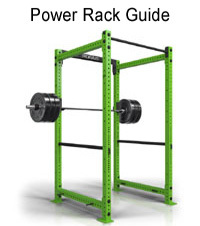 By doing so you actually are paying Titan prices, only on a much better rack. 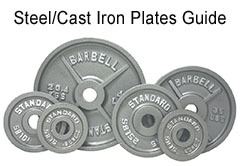 Additionally, you get a real bar and the best plates in the industry, and it all ships for free. No more settling on a budget. Smelly’s MB3 STrong Knee Sleeves are third generation sleeves, and while they are they same great level 3 neoprene sleeves as standard STrong Knee Sleeves, they do feature a new, limited edition, USA-themed color print. MB’s STrong Sleeves are comparable in strength and elasticity as knee wraps, only you can leave them on for the entire workout and squeeze out an extra 20+ pounds of weight. They offer support like any knee sleeves, keep your knees warm, they stay in place during your workout, and there are no irritating seams rubbing against the front or back of your knees. The MB3 STRong Sleeves are 7 mm thick and are sold in pairs for $80. Sizing ranges from XS to 4XL, so they will have your size. Check out the MB3 Elbow Sleeves as well! 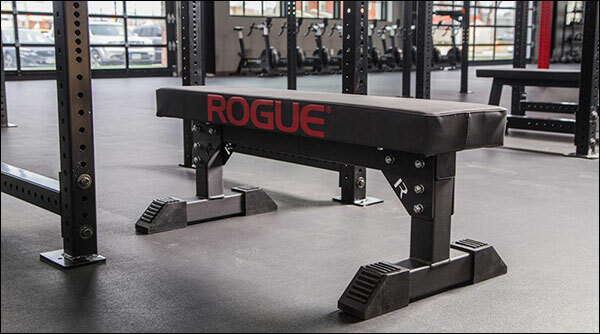 In an effort to make the massive Thompson Fat Pad feel more like a standard-sized bench pad, Rogue is now offering it in a narrower, 12.5″ wide version. The Rogue Competition Fat Pad still has the same 4.5″ thickness, the same 50″ length, and the same grabber vinyl cover, but it will now feel more familiar to those of you who lack the thickness or broadness that makes the original Fat Pad such a treat to bench on. I guess technically this isn’t a ‘Donnie Thompson’ product as it was that 14.5″ thickness that made it as such, but aside from that one change it is the same thing. You’ll still be about 19″ to 20″ off the ground if you install this thick pad onto a standard frame, so keep that in mind. 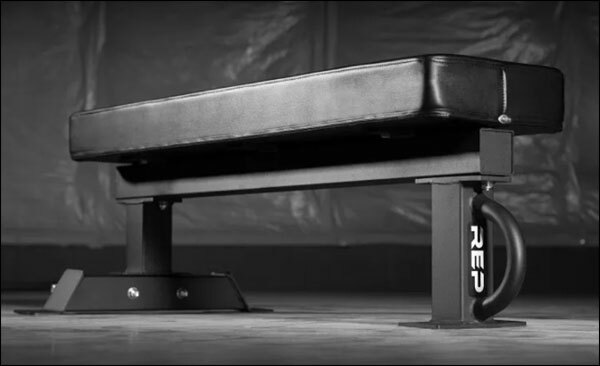 For the record, the Thompson pad is easily the best bench pad option on the market today, and since this is just a narrower version of that pad I see no reason to think this isn’t also a perfect product. 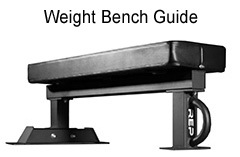 Speaking of Fat Pads, the Rep Fitness FB-5000 is the first non-Rogue Fitness bench frame to be released that accepts the Donnie Thompson Fat Pad (or all Rogue pads), and it’s the only bench frame to be released at all that takes into account the added thicknesses of the various Fat Pads, and has a lower height to offset that extra thickness. With the Donnie Fat Pad installed, the total distance from floor to top of the pad is going to be 17.5″. That’s a perfect (and IPF approved) height. With Rep’s included pad the height is 17″. 17″ is still a good height, but you will absolutely want to replace the pad with one of the Rogue Fat Pads as intended, as the included Rep pad does not have the grabber vinyl, and that’s a huge chunk of what makes the Fat Pads so damn awesome. This is a very affordable yet sturdy bench. 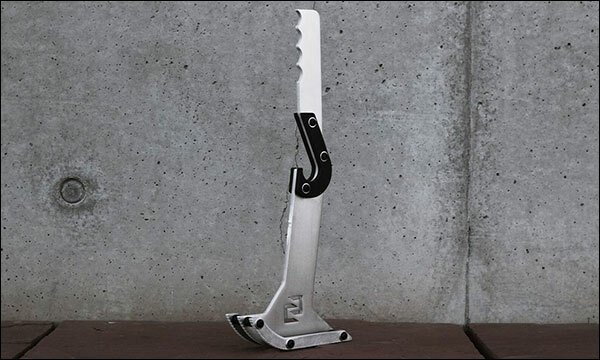 It’s made of 3×3 11-gauge steel, and the design is very minimalist; having only three legs. This set up is quite stable for flat utility benches, and you also get the added bonus of not having the front-facing bench frame legs interfere with your foot positioning. $119 before shipping (Rep doesn’t do free shipping, which could really inflate pricing if you’re multiple zones away from Colorado. Finally, Rep is intending to offer a fat pad with grippy vinyl. Jury is still out on that, but Rep seems confident enough to have asked me to review one, so when I know, you’ll know. 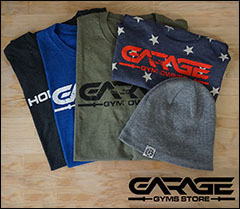 You may have heard that Onnit has some officially-licensed, Star Wars-themed equipment about to be released, and yes it’s true. Included in that collection is a yoga mat of Han Solo frozen in carbonite. Other items in the collection include kettlebells shaped like Vader and Fett, and a slam ball that looks like the Death Star, but I think this yoga mat is the most clever and original idea of the bunch. 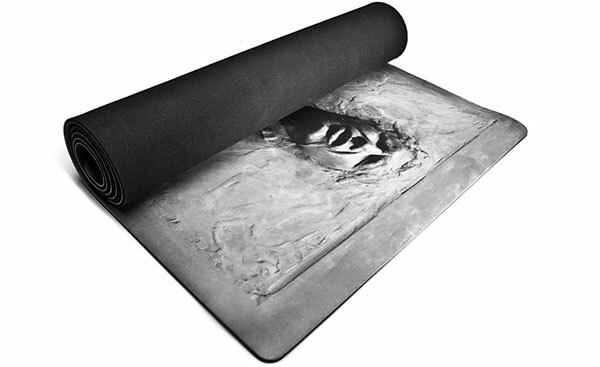 The Han Solo Yoga Matt measures 650 mm x 1800 mm (25.6″ x 70.9″) and is 5 mm thick. It’s a reversible, non-slip, moisture wicking mat constructed of high-quality urethane rubber. It’s not cheap at $64.95, but Disney has to be paid too you know. 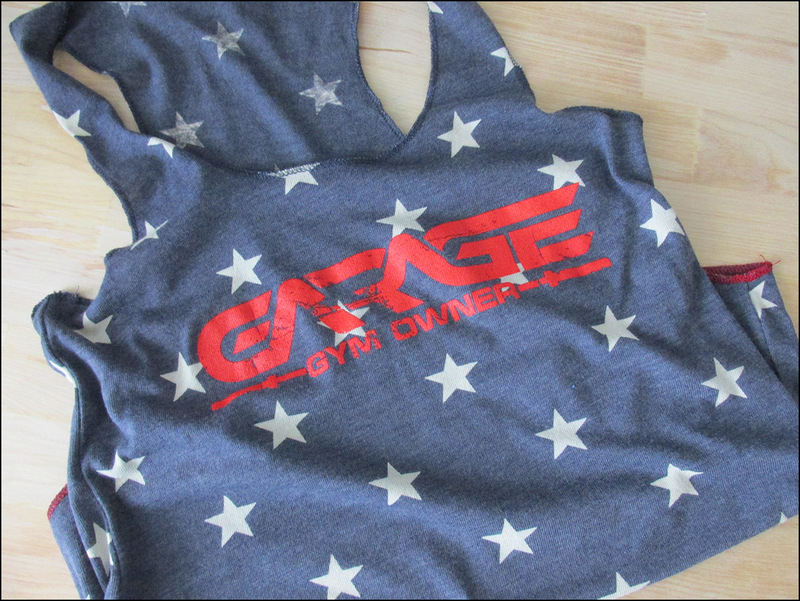 The Garage Gym Owner Women’s Racerback Tank is a premium, tri-blend, fashion print by Alternative Apparel. This blue and white stars theme is from Alternative’s Eco-line, and it is made from recycled and organic materials. The fabric is super soft and lightweight, and the red print and hem give this tank a very patriotic look. This is a very high-quality, nice looking tank – if I do say so myself. $25 with free shipping. Want to add a National event to that list of upcoming events? Leave a comment. Please share this article, have a great 2018, and thanks for your support. 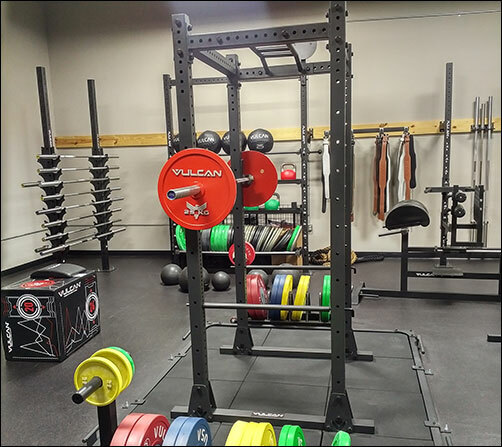 Do you have any experience with the new Vulcan rack? It appears to have westside spacing in the picture so that release threw a wrench in my plan. Was planning on getting a Rogue R-3. I don’t – not yet anyway. 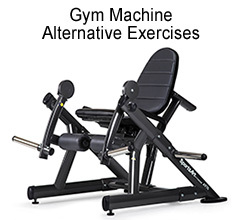 It’s still very new, but I am going to review it because it looks to be a great compromise to more expensive Rogue racks, and the junky Titans. Historically I’ve avoided reviewing racks because I just don’t have the room for multiple racks at a time in the garage (and they are expensive to buy over and over, of course), but I’ve decided that it’s important to include those in the review selection so am currently making room for one of these Vulcans. I will likely compare it to the Titan X3. It does look like it has Westside though in that picture. It may be worth emailing them to make sure if you’re thinking of grabbing one ASAP. I have the (discontinued) onnit multi mat and it is pretty quality. I’m assuming this is the same design as the han solo mat without the artwork. I think I paid like $40 for mine but I use it all the time and it has lasted for a few years now so felt like a good deal. Like you mentioned, Disney has to get theirs too lol. 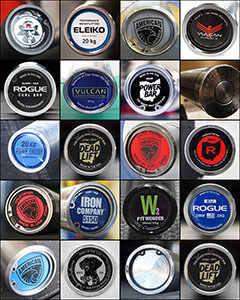 Vulcan rack is now on my “when I don’t live in a basement anymore” wishlist. Really curious about this new generation of air bikes coming out to challenge the Airdyne Pro. Assault has an elite model, Rogue just came out with an Echo (which begs the question, will they make an even heavier duty bike? ), and even xebex has a new offering which features belt drive and magnetic resistance. Not sure that’s a feature I’d care about but it’s an interested time for airbikes nonetheless. I think I’m going to wait a while longer to see how the marketplace settles since belt drives and fully adjustable seating do seem to be a big improvement on the original models. I have a pretty strong feeling that Disney’s share is the larger share haha. I wondered that since they called it the Echo, which sort of implies an economical model. They rarely make an Echo first, you know? It usually follows something. We’ll see when we see, I suppose, as they don’t tend to leak any of their plans to anyone. So incredibly sad I bought a Titan rack before I found your website a few years ago. Now trying to figure out how to stage a horrible Titan rack collapse that doesn’t injury me or damage my house but convinces my finance manager (AKA wife) that buying a Vulcan is the only logical solution. Helpful suggestions gratefully accepted. Lol.. what specifically don’t you like about the titan rack? Which one do you have? Other than jburgeson scaring about its imminent failure during a max squat you mean?? I don’t even know what “pig iron” is but it doesn’t sound right. It works OK for me actually but I can definitely tell that the iron is a little “softer” than you see with better racks. I had to move a plate holder down and you could see where the bolts/washers had chewed into the metal a bit. I think it’s going to be OK for my uses because I don’t plan to go over 400 inside the rack. But you do worry about failure. If I were buying again, I’d definitely look at spending a little bit more on the Vulcan. I didn’t go for the Rogue at the time because that is just a lot to spend for a guy who is a fitness lifter not a competitor. I support the upgrade, but maybe not the method haha. Does your wife use the rack? No, just me. And yes I check for sabotage before every lift… I’m not that popular at home. Yeah, great points. I may have to go the Craigslist route. But if you see some bizarre sh** on YouTube about a Titan cage collapsing, that’ll probably be mine. ha if that happens, send that link!